Are you ready to laugh and have some fun? The Story Lady offers high-energy entertainment and learning opportunities for every age. STORY SESSIONS - A visit from The Story Lady runs about 30-minutes and includes an original tale, poems, and songs. Ali specializes in entertaining children ages 2-7, but she offers story sessions for elementary ages, as well. AUTHOR VISITS - Ali offers author chats that include a performance and special reading from one of her picture books, as well as discussions about writing and storytelling. Topics during discussion often involve: where to get ideas, how the writing process works, how picture books are made, the importance of reading and writing. BIRTHDAY SESSIONS - Ali offers custom birthday stories written just for your child, or you can choose a tale from The Story Lady's story list. Birthday sessions include the main story, interactive poems and songs. SPECIAL NOTE - For custom birthday stories, please try to give Ali 6-8 weeks notice and at least 4 weeks notice when choosing a story from her repertoire. *Performance fees vary depending on audience numbers. ﻿WORKSHOPS for teachers - Brain breaks! Teachers know, quick, movement oriented activities help students regroup and refocus. In her teacher workshops, Ali offers ideas for brain breaks to help get the "wiggles" out, motivate children, and encourage imaginative play. She shares some of the rhymes and activities from her newest book, a resource for teachers and parents called, Smiles & Wiggles: A Year of Imaginative Fun. WORKSHOPS for kids - The Story Lady offers storytelling and theater workshops for children ages 5-11. Workshops can be 3 to 5 days long. They are perfect for summer camps and school enrichment programs. 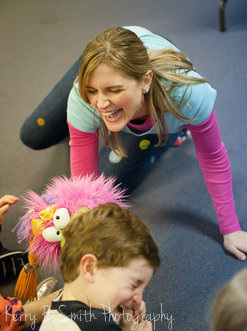 **4 & 5 day storytelling workshops combine theater games with writing activities. Ali guides the children as they write and perform their own stories. CLASSES - The Story Lady has developed 1-hour storytelling and dance theater classes for children ages 5-11. Classes focus on creativity, movement, and imagination. These fun learning experiences work well for weekly enrichment programs and summer camps. *Workshop and Class fees vary depending on the time needed and the number of students. OTHER OPTIONS - Several times a year you'll also find The Story Lady teaching at these arts organizations. ArtHaus Visual Arts Studio - Every summer The Story Lady joins art educator, Meg Foster, to teach art and story camps. Stavna Ballet - Ali teaches Dance Theater for the youth dance program. Interested in having The Story Lady come for a visit? Share some information with us and we'll contact you within 1-2 business days! Please include dates and any other information to help us plan. We'll do everything we can to work with your dates. Please know that completing this form does NOT lock in your desired date. Ali will contact you shortly to confirm ALL details.